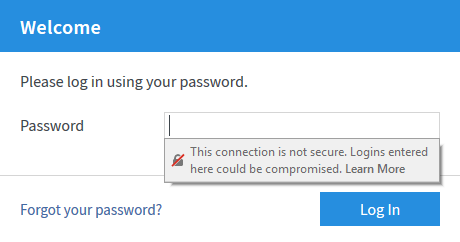 Firefox reports "This connection is not secure"
Mozilla Firefox displays the message "This connection is not secure. Logins entered here could be compromised" when you enter the password for the FRITZ!Box user interface to warn you about transmitting passwords over an internet connection that is not encrypted (see fig.). The connection between your web browser and the FRITZ!Box user interface is not encrypted, but it is only established over your private home network and not over the internet. Since this means that your password is also not transmitted over the internet without encryption, you can ignore the message.